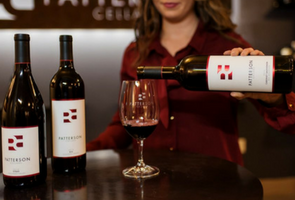 Founded in 2000 by Owner & Winemaker, John Patterson, Patterson Cellars crafts approachable Washington State wines that reflect the new world style in winemaking. Our diverse collection of wine offerings includes robust red blends, elegant single varietals, classic whites, lively rosés sparkling wines and lush dessert wines. Visit us in the Warehouse District of Woodinville to get a glimpse of the winemaking team in action. Make your visit to Patterson Cellars even more memorable with one of our appointment-only tasting experiences featuring JCoco Chocolate and Heritage Restaurant | Bar. From the finest local chocolate to meticulously created food pairings, we will be offering a range of tastings for singles, couples and groups plus add-ons to enhance each experience. Join the club to become connected with our wines, the people who bring them to you and the vineyards they’re from. You’ll receive 12 winemaker selected wines per year at 15% off, a 20% case discount, free tastings for you and a guest at any of our four tasting rooms, plus advance notice of new releases, limited production wines, and upcoming events.